Don’t you love when something that begins in a ‘name first’, execute it later situation works out perfectly? Kind of like this blog. We thought of the name GastroGays, tickled ourselves with how good it sounded, and then decided how to make it into something. 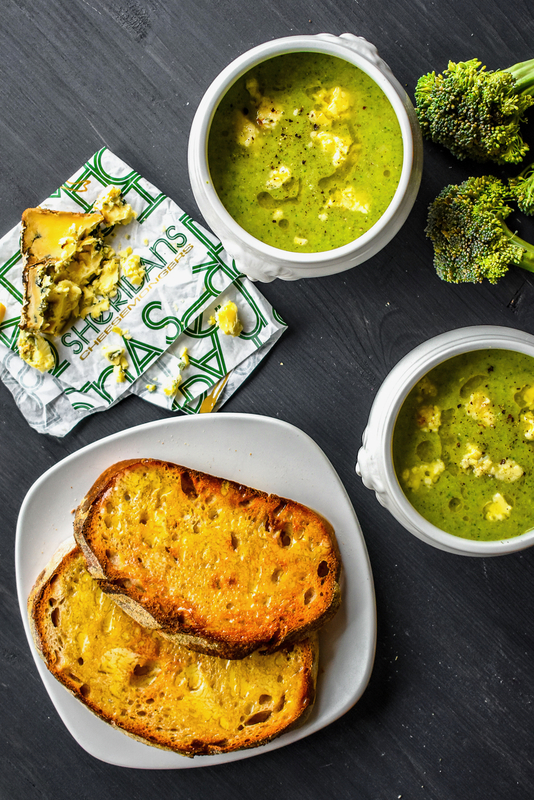 This gloriously green, comforting soup with a strong cheese kick is the same situation. Broc ‘n’ Buck just sounds good. Better yet that it tastes seriously good together. This is a recipe we really love because the couple of times we made it it was using the best of Irish produce – some in fact, we grew ourselves! We sweated the onions, celery and garlic in Dollop Ghee (made in our home county, Louth); we used Sadie’s Kitchen chicken broth for the soup base (seriously amazing Irish-made broth); we used Oriel Sea Salt (produced in Clogherhead, Co. Louth) for seasoning; we went to Sheridan’s Cheesemongers for a couple hundred grams of Young Buck cheese, a fabulous blue produced by Mike Thomson in Northern Ireland; and we grew our very own broccoli in the garden! 1. Sweat the onion, garlic and celery in a saucepan in a little ghee (or oil or butter) for a couple of minutes over a medium-low heat until softened. Add a little salt to help this process and stop anything sticking. 2. Add the potato cubes and after a minute, introduce the stock and bring up to the boil, then reduce to a simmer, put on a lid and allow the potato to completely soften. This should take about 5 minutes. 3. Then, add in the broccoli until just cooked. You don’t want it to lose its colour, so introducing it to the hot liquid only to soften, even a little al dente is desirable, bearing in mind it needs to be blitz-able. 4. When the broccoli is cooked, add 150ml of cold water into the pan to help bring the temperature right back down and add in the larger quantity of the blue cheese. 5. Using a hand/stick blender, blitz the soup instantly to desired consistency, if it’s a little thick you can add in some extra milk or water to thin it to the desired silkiness. Swirl through a little fresh cream if you want it more indulgently rich. Depending ion the time of year this can be a warm, cosy and comforting thick broth or a light lunch, depending on how you make it. 6. Taste for seasoning. Always taste for seasoning – adjust if necessary. You might prefer the fieriness of white pepper? Season to your taste. 7. Serve between four soup bowls (or two larger ones, depending on portion-size) with some slices of crusty bread on the side, fresh from the toaster or grill and spread liberally with some proper real butter. 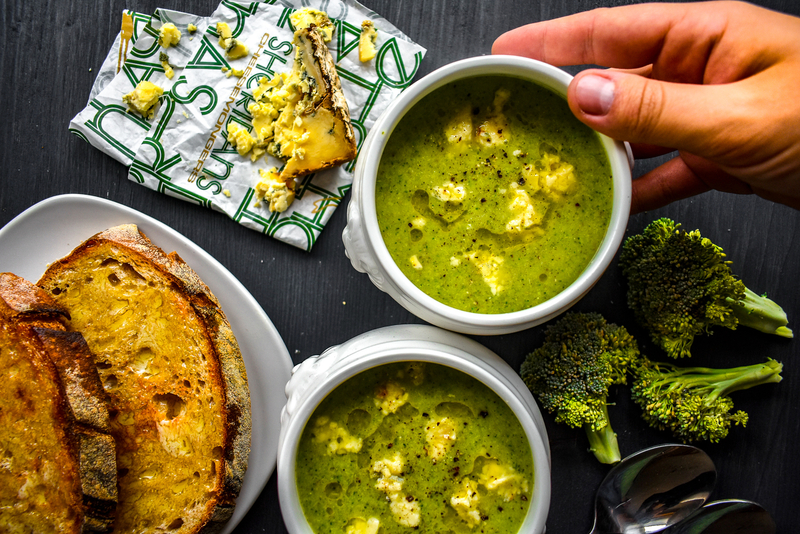 Drizzle the soup with a little oil (plain or flavoured, your choice), a final sprinkling of the crumbled cheese and you could add in some chopped herbs if you like, but we like this plan, simple and seriously satisfying.